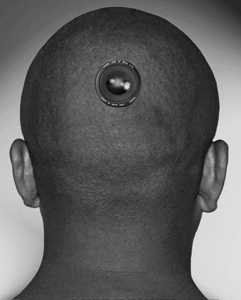 November 17, 2010 /PN/ A photography professor from New York University is taking his art to the next level by having a camera surgically installed in the back of his head. The Iraqi-born American artist Wafaa Bilal has been commissioned by Mathaf: Arab Museum of Modern Art in Qatar to drill the thumbnail-sized camera into his head and have it take pictures at one-minute intervals for a year, with the images to be displayed in the museum after it opens in Doha on December 30. According to the museum, the work is intended to be "a comment on the inaccessibility of time, and the inability to capture memory and experience." The project - called "The 3rd I" - has created a stir at NYU, where students and administrators are worried about privacy issues. Bilal has offered to cover the camera with a lens cap when he is on the N.Y.U. campus, out of respect for students’ privacy, but the university may require him to turn the camera off. "As a school of the arts, a school whose mission is to educate artists, we place a high value on his right to free expression in his creative work as an artist, and take that principle very seriously," NYU Spokesman John Beckman said in a statement. "But as a school of the arts, we also take seriously the privacy issues his project raises, its impact on our students and the importance of preserving trust in the pedagogical relationship between a faculty member and students. Bilal has provoked controversy with earlier projects, including one in 2008 called “Virtual Jihadi,” in which he altered a video game to insert an avatar of himself as a suicide-bomber targeting George W. Bush. so what about his "very" private life? is that going to be also on display? Aside from the healing period and the kinda creepy nature of the project I would love to see those shots after the one year period. Although it's not possible, I'd rather see what he's looking at than see what he's turned away from. Don't all teachers have eyes in the backs of their heads? Lots and lots of photographs of his pillow. From the hallowed halls of academia......keep thinking I am reading this in The Onion. The article puts a laugh in my heart at our own inability to see things for what they are...most times a futile attempt at 'seriousness' that is at best a folly. OK, so maybe it is art, on some level, but aside from the intention to have the back of your head take pictures there is no observation, no VISION, there is in fact nothing more photographic about this than there is with a security camera. It is technological knee jerk silliness that might elicit interesting images by accident. It would be more interesting to hand cameras to infants.